An empty can has a great shape to turn into a bracelet that easily fits on a wrist. Of course, you'll have to do a little work to make it safe to wear, but the results can be stunning. Simply use a box cutter or pair of kitchen shears to cut off the top and bottom of the can, and then cut it into segments that work for you. You may want a very wide bracelet, or a bunch of smaller widths. About an inch is good for starters though. Make sure there are no sharp edges, and then decorate it by wrapping ribbon or cloth around it. If you have someone with a particularly large wrist, you can cut it, but make sure you wrap those edges carefully, or round them off. If the can already has a really great design, you don't need to wrap it at all! If you do a lot of camping, or like cooking in the outdoors, you don't have to buy a portable stove. 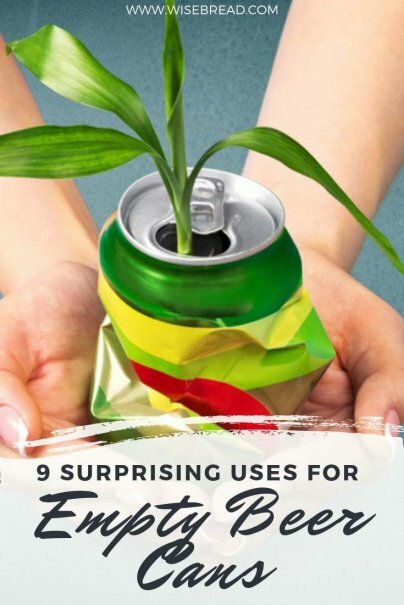 You can make one out of an empty beer or soda can, and it works incredibly well. All you need is something to cut the can with, and some fuel (rubbing alcohol works beautifully). The best part is, if you leave it behind, or it gets thrown in the trash, it costs nothing to replace. Pens. Pencils. Screws. Hair Ties. Batteries. Cutlery. There are hundreds of different items at home that can be organized inside empty cans. You just have to cut the top off the can at the height that works best for you. If you have a junk drawer, cut them just below that height, and you can quickly organize all those little bits and pieces that clutter it up. For the garage or workshop, you can make them different sizes for different items. You could even screw them to the wall. Creating a lantern out of a beverage can takes a little skill and dexterity, but if you can follow a pattern, and work with a few basic household tools, you shouldn't have any problems. Simply cut an oval in your can, and spray paint it any color you want. Then, create a stencil of your favorite subject matter, and use it to cut a sheet of heavy-duty aluminum foil. Put the two together, add a light, and you have something very fun and decorative. You could even use these at Halloween in place of pumpkins… and they don't wither and die. If you have the time and the patience, beer can jewelry can really set those tongues wagging. It will be unique, unusual, and not available in any stores. Some people simply cut out parts of the empty can's design into interesting shapes, like teardrops or ovals. Others go the extra step, adding imitation gemstones, glitters, and other adornments. Take some inspiration from these earrings selling on Etsy (yeah… you could make money!). An empty beer or soda can is a great vessel for starting your garden's plants, flowers, and herbs. All you need to do is remove the top of the can with a can opener to give it a clean, safe edge. Then, spray it your favorite color. Add soil, seeds or cuttings, and a little water, and you can save serious money on planters you would buy at a home improvement store or garden center. Do you have a poor Wi-Fi signal in your home? You could fork out a lot of cash on a signal booster, or a Wi-Fi router upgrade. Or, you could take one of your empty cans and make a booster that will take you from two bars to four. It should take you less than 10 minutes from start to finish. Just make sure all the edges are safe, especially if you have kids in the house. If you are into historical re-enactments, attending Renaissance Fairs, or want to make some extra cash on the side, you can use the pull-tabs from your beer and soda cans to create chain mail. Not only does it look really authentic, it can be done with just the pull-tabs and a few simple tools. If chain mail isn't your thing, you can use the same techniques to make lampshades, belts, bowls, and several other creative ideas. The material used to make a beverage can is not as thick as it used to be. While this means you don't get a lot for the scrap, it means you can do some very cool things using tools you will find around the house. The material is so soft that you could actually draw into it with an empty ballpoint pen, and punch through it with a nail and create some beautiful personalized punch designs Just make sure you clean out the can thoroughly, and find something suitable on which to mount your finished piece of art. Here in Michigan you return them for 10 cents. It is called a bottle deposit and forces you not to waiste valuable recycleables.